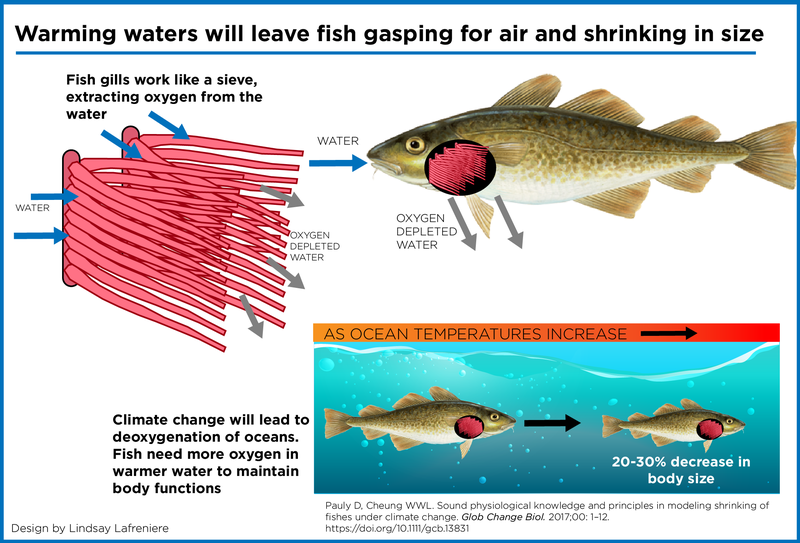 Warmer waters increase fish’s need for oxygen but climate change will result in less oxygen in the oceans. This means that gills have less oxygen to supply to a body that already grows faster than them. The researchers say this forces fish to stop growing at a smaller size to be able to fulfill their needs with the little oxygen available for them. Some species may be more affected by this combination of factors. Tuna, which are fast moving and require more energy and oxygen, may shrink even more when temperatures increase. Overall, smaller fish will impact fisheries production as well as the interaction between organisms in ocean ecosystems. Pauly and Cheung’s study “Sound physiological knowledge and principles in modeling shrinking fishes under climate change” will be published in Global Change Biology doi: 10.1111/gcb.13831.